6th Annual Black Ties and French Fries goes to Paris! Name: 6th Annual Black Ties and French Fries goes to Paris! Join us for an elegant Parisian themed gala! 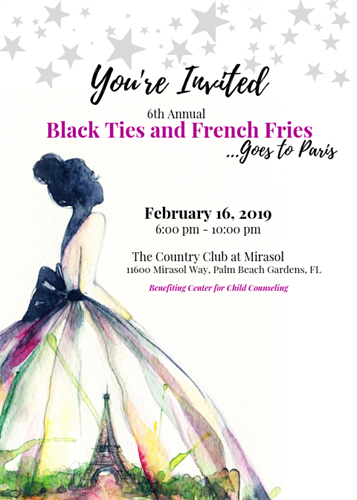 The premier, annual, Black Ties and French Fries Gala for the Center for Child Counseling is in its 6th anniversary and this year, the gala goes to Paris! Have your whole family join us for our fun filled, elegant, Parisian themed gala (children welcomed)!